"The Keyblade belonging to Master Eraqus. It boosts all your stats." The Master's Defender is Master Eraqus's Keyblade. It is later passed on to Master Aqua, and it appears in Kingdom Hearts Birth by Sleep, Kingdom Hearts 0.2 Birth by Sleep -A fragmentary passage-, and Kingdom Hearts III, where it is briefly wielded by Sora. A digital simulation of the Keyblade is wielded by Armor of Eraqus, while an illusory copy is wielded by Phantom Aqua. Like his erstwhile friend Master Xehanort, Master Eraqus rarely draws his Keyblade. When he does fight, he is able to use the Keyblade to channel his own light magic. 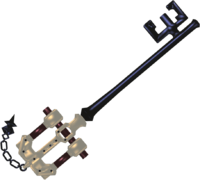 However, even after Master Eraqus is slain by Xehanort's hand and the Land of Departure is devoured by darkness, his Keyblade remains. After destroying Vanitas, Aqua takes a comatose Ventus back to the Land of Departure, where they find Eraqus's Keyblade. Following Eraqus's prior instructions, Aqua uses the Keyblade to transform the world into Castle Oblivion, a labyrinth which can only be fully navigated by herself, and hides Ventus's body within. Although Aqua keeps this Keyblade, she does not actually wield it until after battling Terra-Xehanort with her own Keyblade and sacrificing it to save the remnants of Terra within him. Aqua continues to wield this Keyblade as she advances through the Realm of Darkness. During her journey, she encounters a phantom of herself, who wields an illusory copy of the Master's Defender. After the Door to Darkness is sealed and Aqua witnesses the worlds being restored, the Master's Defender falls away from her. Sora picks up the Master's Defender. Aqua is defenseless against Ansem, Seeker of Darkness without the Master's Defender, and is corrupted with Xehanort's darkness. The Master's Defender ends up on the shores of the Destiny Islands, where Sora finds it and uses it to open a door to the Realm of Darkness. After Sora frees Aqua from the darkness, she resumes wielding the Master's Defender, first using it to transform Castle Oblivion back into the Land of Departure and wielding it during the clash between light and darkness. After Xehanort's defeat, Terra, Ventus, and Aqua return to the Land of Departure and use the Master's Defender, with their Wayfinders placed on it, to honor Eraqus as a gravemarker. The Master's Defender has a smooth, cylindrical, grey shaft that tapers outward at both ends. It has a boxy guard, made up of two small, light grey boxes and copper rod. The base of the guard connects to the grip, and both sport several small indentations lining them. 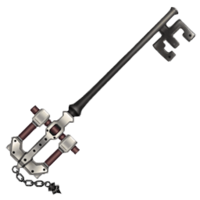 The grip itself is somewhat unique in that, while most Keyblade grips are cylindrical, the Master's Defender's grip is squared. The teeth are in the shape of an "E". The "E"-shaped teeth and the square grip are likely an allusion to "Square-Enix", which Eraqus's name also references. Its Keychain is made of several simple chain links and its token is the Terra's Mark symbol that appears on Eraqus's, Ventus's, Terra's, and Aqua's clothing. The Japanese name of the Master's Defender, "Master Keeper", reflects that it is used exclusively by characters with the title of "Master". "Defender" can mean "guardian", which may reference its use by Keyblade Masters to guard the Land of Departure. The Defender is also a recurring weapon in the Final Fantasy series.